Two miles south of N.H. Route 103 and one-half mile west of Chandler Station on the Concord and Claremont Railroad line in Newport spanning the Sugar River. 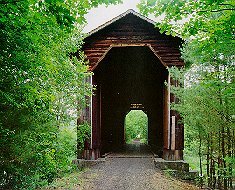 The bridge is 123'9" long with a clear span of 121'9". It has an overall width of 20'6" with a railway width of 14'9" and a maximum vertical clearance of 21'3". This section of rail line has been abandoned.